But how friendly a city is it for kids? Bottom line, since we’re talking about Israel, kids are the #1 priority everywhere. And Jerusalem is no exception. The biggest problem one tends to face with Jerusalem as a destination is where to go and what to do. It isn’t so big, but with 5000 years of history, you really need to pick and choose how to spend your time as there is so much to see. 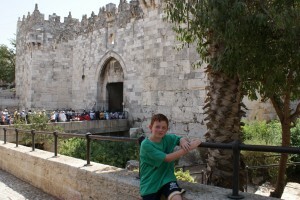 Our favorite – Hezekiah’s tunnel! This tunnel was dug by King Hezekiah about 2700 years ago to bring water into Jerusalem. It’s even mentioned in the Bible. Today it is part of the City of David national park – Climbing down a couple of fights of stairs one passes through thousands of years of history until you reach the tunnel entrance where you find someone selling tiny little flashlights. Buy a couple (or take your own) and enter into a narrow passageway with water streaming through, going up to your ankles (or nearly your knees if you’re a kid). Then walk for about 20 minutes through a pitch black (that is why you have the flashlights!) passageway (with a ceiling that varies from very low to very high), and try go first thing in the mornings, before the crowds arrive. Eventually you emerge on the other side. My kids loved this, and it is especially good on a hot summer day. The most incredible thing, is that back in about 700 BC, two teams, working with primitive tools, dug this tunnel through the solid rock from two separate ends and amazingly managed to meet up in the middle. There was even an inscription in the tunnel (now removed to a museum) commemorating the meeting up of the teams. Kind of like digging the Chunnel in ancient times. The religious sites are awesome – packed with pilgrims, people at prayer and tourists. Security is tight in Jerusalem – to enter into the Western Wall precinct you must pass through metal detectors, and seeing soldiers and armed police everywhere becomes second nature after about ten minutes in Israel. The kids of course found this exciting, and Jerusalem has been a pretty safe place to visit for many years. If the Dome of the Rock is open, (it is sometimes closed to visitors) you must go – it is one of the greatest Islamic sights. The Church of the Holy Sepulcher is dark and gloomy and you may see an Ethiopian monk walking about – straight out of a Dan Brown novel. The markets of the Arab sections of the Old City are fun – they mainly sell tacky tourist stuff, but near the Damascus Gate there are genuine stores catering to locals and the atmosphere is amazing. The food is good too – try large falafel balls that almost fit into your palm.My favorite food is knafe – a layer of melted cheese covered with syrup – very sweet and very delicious. Elsewhere you’ll find the Biblical Zoo – we are not huge on zoos, but this zoo is outstanding, and an excellent place to take young kids. Jerusalem also has many museums – we enjoyed the Burnt House, a small intimate museum that tells the story of the Roman conquest of Jerusalem in the year 70. They show a movie that my kids found really interesting and by focusing on a relatively small event (the burning down of a house), kids can actually get a good idea of some of the history. The major museums are very good but “kid friendly” is questionable – Yad Vashem is the Holocaust Museum – kids under 10 are not allowed, and I’d say don’t take kids under 13 – it is one of the best museums I have been to but the subject matter is totally unsuitable for children. The Israel Museum is the premier museum in the country with sights such as the fascinating Dead Sea Scrolls. My kids love museums, but not all kids do. The streets of the “new” city are very atmospheric as well, and there are many excellent restaurants hidden all over. Our favorite food is the street food – falafel, shwarma and pizza by the slice – something Israelis really love. Jerusalem is less than an hour from Tel Aviv by car or bus – so one can conceivably stay in the one city and visit the other. But taking into account the traffic which can really get out of hand, and the time it takes to get the average family up in the morning, I’d say one should stay in both cities. And then there is the desert, just outside of Jerusalem – my tip – if you are there anytime from October to April, go – its amazing. Sights include the Masada Fortress and the Dead Sea, and there are wonderful hikes taking in hidden oases and waterfalls. But if you are there in summer as we were – think twice – the heat is incredible, and we decided to wait for a better time of year. Certainly you can visit, but you’ll want to be seeing the sites in the very early morning. By midday all your kids will want is to be in the hotel pool. The Dead Sea doesn’t count – don’ t even think of getting any water on your face (especially eyes and mouth) and getting off the salt afterwards needs a long shower! Not a sea to take kids swimming in! PS: These days I plan great family trips to Israel and Jordan. Click here for more info. Previous PostIsrael with Kids (3). The North.